Companies whose operations pose a potential accidental spills hazard should “take nothing for granted” when they draw up emergency action plans. Mr Neatherway was speaking at a ‘Pollution Prevention and Response’ seminar organised by the North East steering group of the Institute of Environmental Management and Assessment in Durham. Mr Neatherway told the delegates it was essential for all companies where spills were a possibility to carry out adequate risk assessments and have comprehensive emergency response plans ready for implementation. He said CSG, which is a founder member of the UK Spill Association and runs its own 24-hour spills emergency service, handled many volatile materials in its work as a hazardous waste manager. 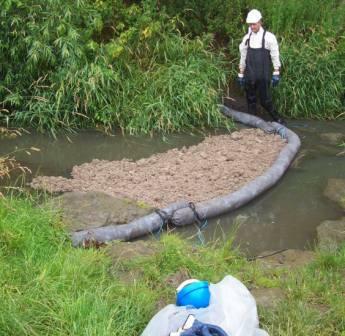 Picture: Oil contamination clean-up using floating booms and absorbent pads.